Economical yet secure toilet seat has large front and rear cut-out areas for convenient personal hygiene, with a deep splash guard to minimize accidents. Gentle downward slope toward the front makes getting on and off easier. Lightweight, all-plastic construction offers strength, durability and warmth. Smooth, gently contoured surface resists stains and odors. Fully sealed unit cleans with a hard-surface disinfectant. 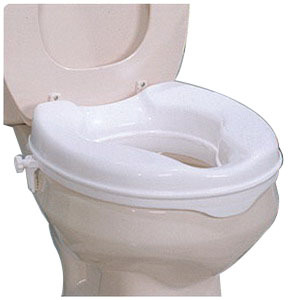 Two L-shaped molded-plastic brackets keep the raised seat firmly on the toilet. Can be adjusted to fit onto most sizes and shapes of toilets. Front is secured by a lip that does not snag skin or clothing. Fitting and removing the seat is quick and easy.